Madison - For the third straight season the Crusaders of Morris Catholic are on top of their game. 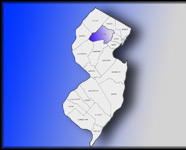 Defeating the Roxbury Gaels 52 - 40 in the Morris County Girls Basketball Tournament. 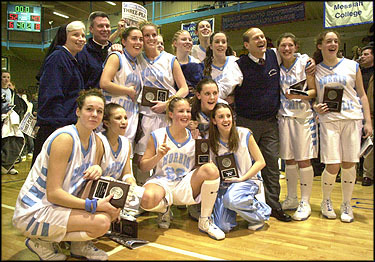 The final game of the tournament was held on February 20, 2004 in front of a packed gym at Fairleigh Dickinson University. (top) The Morris Catholic Crusaders are joined by Principal Sr. Marie Pauline Demek; Director Fr. Paul Manning; and Coach John Olenowski. (right) MC #23 Claire Wilson shoots for 8 points on the night. 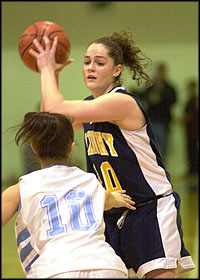 (above left) Roxbury #20 Laura Ahern, is covered by MC #10 Elizabeth Mascia. 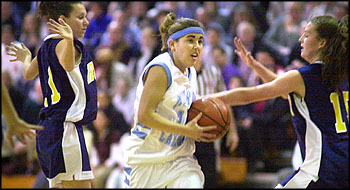 (above right) MC #14 Megan Olenowski drives past Roxbury #11 Nicole Irving and #15 Janel Cleffi. 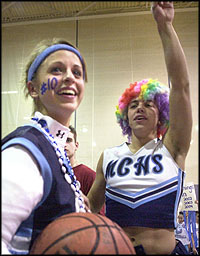 (left) Morris Catholic fans. 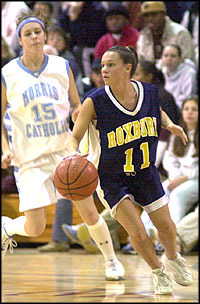 (right) Roxbury #11 Nicole Irving, gets past MC #15 Allison Dunn. (below left) Roxbury players cheer their team on. (below right) MC #20 Katelyn Monteleone, and her teammates cheer for their fellow Crusaders. 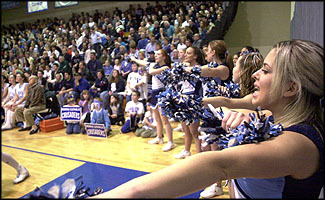 (right) Morris Catholic Cheer Leaders, keep the crowd going strong.